Commercial outdoor lighting fixtures are the best fit for lighting public spaces since they have a long life span and require little maintenance. Commercial spaces require the right type of lighting suited to stand up to the challenges of a commercial environment. The proper lighting fixture can produce a high lumen output suited for large outdoor lighting projects. Choosing the right commercial outdoor lamps for your space is critcal to producing the look that you desire for your commercial space. Highly trafficked public spaces can be your fixture's worst enemy so installing commercial outdoor lighting made to withstand this abuse is your best defense. Weathering, basic wear and tear, and vandalism are all common enemies that your fixtures will face daily so choosing a fixture with all the right features will protect your lighting equipment for years to come. First thing you want to make sure of is to choose a fixture with a strong and sturdy housing. You will find various choices of material to choose from and may even decide on the thickness of a fixture's housing. Look for fixtures that can be easily aimed and make sure they come equip with a secure locking mechanism. Nobody wants to have to constantly re-adjust a fixture after its put into position especially if it's out of reach. Having a strong and sturdy lens will save you the headache of having to replace expensive bulbs due to vandalism. Look for fixtures that have an impact-resistant lens. Prevent your fixtures from being disassembled so make sure your fixtures contain a tamper-proof screw or any other feature that will prevent unauthorized disassembly. Install lighting fixtures designed to stand up to substantial impact especially if they will be installed in highly trafficked areas. Some fixtures such as commercial path lights, outdoor bollard lights, and post lights all need to have a sturdy design to withstand an ample amount of contact with people. 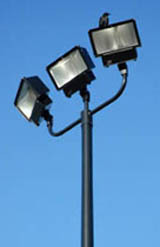 Commerical outdoor lighting fixtures are durable and will last a long time. Making the right choice is important in choosing the right fixture for your needs. Stay up-to-date with all the latest web updates, news, and outdoor lighting tips! I promise to use it only to send you The Lighting Post. Always consult with a licensed electrician before attempting any outdoor lighting work contained in this website.